How Much Do House Painters and Painting Companies Charge Per Hour? You are here: Home \ Blog \ How Much Do Painters Charge Per Hour? As a house painter in Los Angeles, I often get asked this question. Painters, painting contractors, or painting companies usually work per project. This means they only work when a client asks them to paint their house. Hence, painters would normally charge per hour. When they give you a paint estimate they also have an estimate of how many hours they would take to finish the project. From there, they can extrapolate their charge per hour. You the future client are also interested because you want to know if your painter is charging you a reasonable rate. 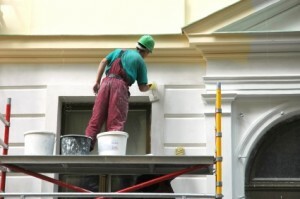 There are several factors that can determine the cost of painting per hour. These include: location (state, city, community), type of painting job (interior or exterior), years of experience, labor affiliation (union or non-union), season (summer, spring or fall), and work affiliation (employed by a contractor or self-employed). The Bureau of Labor Statistics reports that 45% of all painters are self-employed. The number may be slightly higher since many small painting contractors or companies hire self-employed or freelance painters. In the summer season, the hourly rate of self-employed painters range from $25 to $40. A few experienced painters charge slightly higher. The rates mentioned here are for the summer season since people usually have their home improvement projects done in the summer. Painters lower their rates in spring and autumn when painting jobs are much less in demand. Painters who work for a small business or construction company have a smaller range of pay. The average painter working in these areas earns about $15 an hour, with building-finish contractors generally paying more than residential building construction. Non-residential building contractor compensate painters with an average hourly rate of $16.75 an hour. Painting companies pay their painters a smaller rate so that they can put their own mark-up with their rates. Their total per hour rate will then be competitive to the $25 to $40 charged by independent painters. The mark-up includes payment for administrative costs and paint supplies. You may wonder at the range of prices and be perplexed with rates that go beyond $40. You have to remember that painters have now evolved from mere workers to craftsmen. You are paying them not to do semi-skilled labor but to do creative work as well. Of course, you are not hiring a Leonardo Da Vinci or Vincent Van Gogh. But, in the end you would still like your repainted home to look like a true work of art. To get a no obligation painting estimate, contact us today. One Response to How Much Do Painters Charge Per Hour?